Pot Luck: Do it now. Whatever it is. 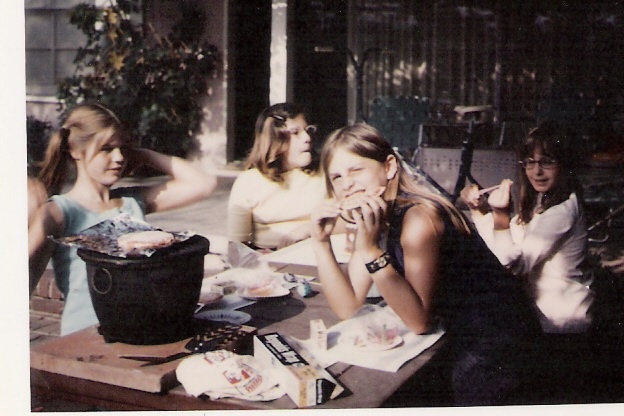 That was my twelfth birthday party with my three best friends, Mickey, Diane, and Emily. In case you don’t recognize me, I’m the one hamming it up for the camera. But the important thing in this picture is the hibachi. That’s what I learned to barbecue on. No bells, no whistles, just you and the coals, and a need to time them just right. As an adult, I moved up a bit in the barbecue world and got a pretty red Meco that stood me in good stead for several years. Since virtually every photo I’ve taken since 1989 is in one of several large boxes in my office (see Confessions of a Pack Rat), here’s a generic picture of a Meco like the one we had. Oh, how we loved that Meco. It was there that I really learned the ins and outs of barbecue, from burgers and hot dogs to kabobs and chicken satay to our fabulous marinated tri-tip. By the time we moved to Wisconsin, we’d gotten into the habit of barbecuing several times a week, year-round. You can’t do that in Wisconsin, by the way. In these parts, you get to barbecue from May to October if you’re lucky, and more likely only in June, July, and August. And when I moved to Wisconsin in 2000, I left my barbecue behind. Not because I didn’t want to barbecue anymore, but because it just wasn’t practical to move the dirty old thing, much as I loved it. I told myself I could just get a shiny new one for forty-some bucks after we got to Wisconsin. But when we got to Wisconsin, I couldn’t find one. It was September, and barbecue season was over. The idea of a barbecue season hadn’t occurred to me, but in any event I had to wait until summer rolled around again. And when it did, I couldn’t find a Meco anywhere. There were imitators, of course, but all of the other charcoal grills I found seemed either too flimsy or too fancy. The fad in Wisconsin at this time was gas. Gas, with every imaginable bell and whistle. I didn’t want a gas unit. It just wouldn’t be the same. The key in all of my barbecue history is charcoal. Ah, the smell of a fire just getting underway— To me, that is the smell of summer. (That and Sea & Ski, which they don’t make anymore.) And the taste of food cooked over a just-right bed of glowing charcoal simply can’t be compared. But my well-meaning husband (then boyfriend) talked me into it. It’s cleaner, he argued. You won’t need to worry about disposing of the ashes. You don’t have to wait for the coals to be ready, and you don’t have to worry about leaving it unattended—you just shut off the gas when you’re done. Plenty of good arguments in favor of gas grilling. I had misgivings, but I went out and got the best dang gas barbecue I could find. Well, OK, the best I was willing to pay for. It was a Char-Broil with a side burner, which was very de rigueur back then, you know. It felt like cheating. I was always afraid I would leave (or had left) the gas on, it didn’t smell right, and worst of all, there was no ritual. Finally, no matter what I did, the food tasted all wrong. Tom said I’d get used to it—I just had to use it more often, he said, and I’d learn to love it. But I didn’t. Didn’t use it much, and hated it every time I did use it. Every time I was in a box store, I’d look longingly at the charcoal grills. But we’d spent enough on this one to have trouble justifying the purchase of another grill of any kind. It still worked fine after twelve years. Yes, I said twelve years. But then everything changed. And the reason was seemingly minor: In 2012, my youngest son requested carne asada for his birthday dinner. After twelve years, I’d gotten to the point where I barbecued only two or three times a year, and I didn’t enjoy it. All the fun and skill had gone out of it. But I never refuse a birthday dinner request, and I decided I simply was NOT going to make carne asada on the gas grill. So I got out the flimsy little tabletop charcoal unit we kept in the RV and put it together. And oh, the joy, the rapture I got from every single step! Stacking the coals just so, squirting just the right amount of fluid on them, starting them in six different spots, the satisfaction of watching the flames flare and then die down as the coals began to ash over. And oh, the smell, the wonderful smoky smell of that little barbecue—the smell of summer! 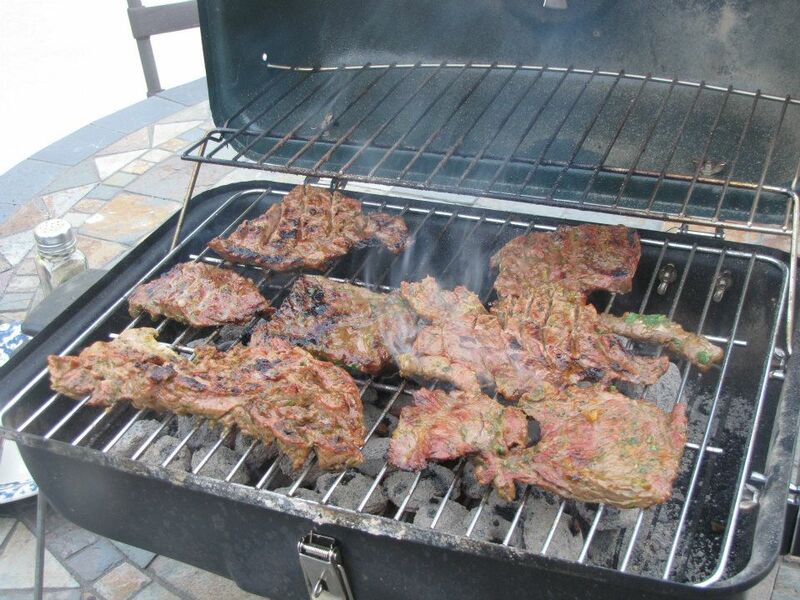 As I cooked that carne asada, I realized that I had wasted twelve years, that twelve summers had passed without the wonderful, incomparable, fabulous odor of charcoal burning. The finished product was just what it should have been–tender, tasty, cooked to perfection–and properly smoky. I did use the gas grill a couple of times after that, but meanwhile I spent the whole of last summer also researching charcoal grills and keeping my eye on the box-store sales. 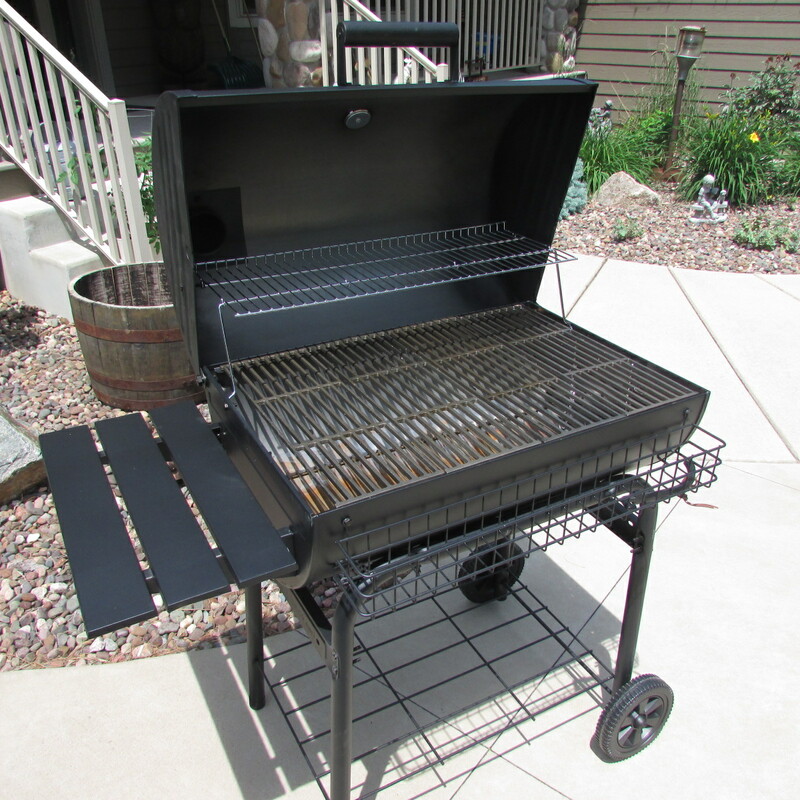 I eventually found the grill I wanted (still no Mecos in these parts, but something I think will be even better), but by the time I found what I wanted, nobody had any of them. I seasoned it yesterday afternoon and fired it up for the first time last night. Stacked the coals, lit them, and went in the house to get the burgers. When I came back outside, my very first breath told me I’d done the right thing, and had waited much too long to do it. The whole world smelled like summer, the way summer is supposed to smell. My middle son has gleefully taken possession of the gas grill, which still works just fine. But as for me, I’m sticking with charcoal from here on out. There’s just nothing else like it. If there’s something you used to enjoy, that you think you’ll never do again, let me assure you, it’s not too late. Do it now. Don’t let another day, week, or month go by. Do it now.